Ce panneau se trouvait dans le hall d'entrée du musée de la 16.VA à Wünsdorf, juste à côté de son QG. Il représente le drapeau des VVS recouvert de l'ordre du Drapeau rouge. Le texte précise : "Forces aériennes militaires du ZGV, décorées de l'ordre du Drapeau rouge; Toujours en alerte, Toujours prêtes au combat". © H.Mambour. That display board was at the entrance of the 16.VA museum located in Wünsdorf, next to their HQ. It represents the VVS flag covered with the Red Banner order. The text says: 'Military Air Forces of the ZGV, awarded with the Red Banner order; Always on the alert, Always ready for combat'. © H.Mambour. Lors de la Grande Guerre patriotique, les unités qui s'étaient particulièrement distinguées au combat pouvaient être promues unités de la Garde. Décorer les avions de l'emblème distinctif de la Garde était alors autorisé et tout le personnel sans exception pouvait porter le médaillon ci-contre. Huit unités de la 16.VA et de l'AA jouissaient de ce privilège au moment de la réunification. © H.Mambour. During the Great Patriotic War, units with exceptional combat records could be promoted as Guards units. The application of the Guards emblem on the aircraft was allowed and all the personnel without exception could wear the medallion illustrated here. Eight regiments or divisions of both the 16.VA and the AA had that privilege during the 90s. © H.Mambour. The 16th Air Army was born in August 1942 in the hell of Stalingrad from elements of the 8th Air Army and air reserves of the Supreme High Command of the Red Army. The 16th Air Army (16 vozdushnaya armiya - 16.VA) was, until its departure from unified Germany in the spring of 1994, the mainstay of the Soviet Military Air Forces (VVS) in GDR. (1). 16.VA elements fought tirelessly from 1942 to 1945 until the invasion and the final defeat of nazi Germany, many of its constituent units gaining prestigious and martial titles that were attached to their names in combat operations. In three years of combat, thirty of its divisions and regiments had been raised to the rank of Guards units and more than 200 of its pilots were awarded with the title of Hero of the Soviet Union. 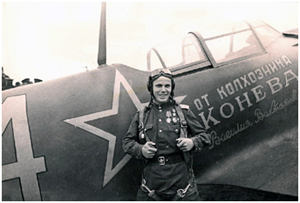 Among them, the top ace of the VVS and the Allied forces, Ivan Nikolayevich Kozhedub, triple Hero of the Soviet Union with 62 victories in air combat obtained mostly on the Belarus Front during some 326 war missions. As an Air Army with strong traditions, the 16.VA could not disappear from the order of battle of the new Russian VVS. On 1st November 1993, the 16.VA was reestablished at Kubinka in the Moscow Military District (located precisely 65 kilometers southwest of the Russian capital), and by chance or by a deliberate decision of the Russian military authorities, it still controlled some of the regiments which were under its command at the end its presence in Germany. With three fighter divisions, two fighter-bomber divisions, two assault regiments, reconnaissance and electronic warfare units and its own fleet of tactical transport, the 16.VA was without doubt one of the most modern, if not the most powerful component of Soviet Frontal Aviation (or Frontovaya Aviatsiya - FA) in the summer of 1990. Considered as an elite army, it often received with priority and before the air armies stationed on the national territory of the Soviet Union, most of the new operational material (see > 1980 statistics). A few years ago, the famous test and demonstration pilot Anatoly Kvotchour confessed in an interview granted to the British magazine AirForce Monthly that it was upon the most popular and sought after posting by freshly graduated pilots from the weapons schools (2). 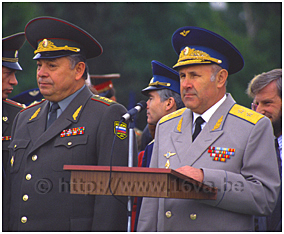 On the left, general Burlakov, supreme commander of the Western Group of Forces, together with General Tarasenko, commander of the 16th Air Army (Sperenberg, 27 May 1994). © JL.Debroux Le Quartier Général de la 16.VA à Zossen-Wünsdorf. © G.Botquin. The 16.VA Headquarters at Zossen-Wünsdorf. © G.Botquin. 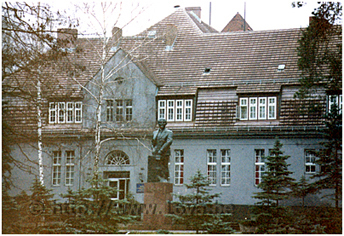 16.VA was under the command of Lieutenant-General Anatoly Fyodorovich Tarasenko (May 14, 1988 to December 27, 1993) during its last years of existence in Germany and its headquarters was located next to the one of the GSFG at Zossen-Wünsdorf, situated some thirty kilometers south of Greater Berlin. It was a huge complex of barracks, administration and command buildings, of which the overflight was forbidden at any altitude. In peacetime, the 16.VA was organized into two corps: one in the North, with its headquarters at Wittstock (71.GvIAK) and another one in the South with its headquarters at Wittenberg (61.GvIAK). In case of a conflict, this structure would have been split and adapted to a strategy of two fronts toward the West. For that matter, the 16.VA would have been divided into two separate air forces, each one of four divisions. Composed in the late eighties of a maximum of six air divisions, the missing assets would have been provided by the air divisions of the East German AF, the Luftstreitkräfte/Luftverteidigung (LSK/LV). The latter was composed in 1989 of two fighter divisions comprising six fighter regiments (four flying MiG-21, one on MiG-23 and one being converted to MiG-29), and one tactical element composed of three fighter-bomber regiments (one on MiG-23BN and two on Sukhoi Su-22M4). Médaillon émis à l'occasion des 50 ans d'existence de la 16.VA en 1992. © H.Mambour. Medallion produced in 1992 to celebrate the 50th anniverary of 16.VA. © H.Mambour. These units could be integrated immediately to the Soviet plans as they were not only equipped with Soviet material, but also operated accordingly to VVS procedures. 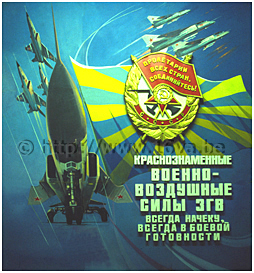 Like most Soviet tactical air armies, the 16.VA was composed of air divisions (or Aviatsionnaya divizii). Each division consisted generally of three regiments (or Aviatsionniy Polk), themselves generally structured in two or three squadrons (or Aviatsionnaya Eskadrilya), each equipped with twelve to fifteen aircraft. The 16.VA accomplished mainly four types of missions in the G.D.R. : air defense, air interdiction, ground attack and tactical reconnaissance. Décollage d'un Su-24 "Fencer-C" de la 16.VA. © DR.
A 16.VA Su-24 "Fencer-C" on take off. © DR. Two bomber regiments were attached to the 105th Fighter-bombers air division (Aviatsionnaya divizii Istrebiteley-Bombardirovchtchikov - ADIB) of the 16.VA. 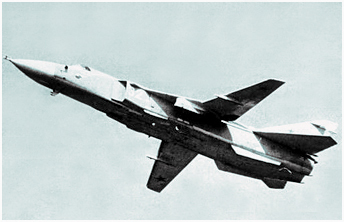 In 1981, the 116 "Radomskiy" GvAPIB (Gvardeiskiy Aviatsionnyy Polk Istrebiteley-Bombardirovchtchikov - Guards Fighter-bomber air regiment) from Brand exchanged its Su-7B/BM against thirty Su-24 "Fencer-B/-C", becoming a bomber regiment (Bombardirovchtchnyy Aviatsionnyy Polk - BAP) (3). 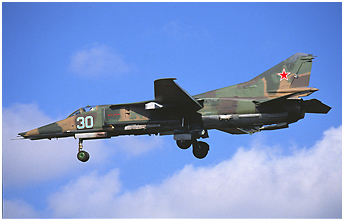 When the unit upgraded to Su-24M "Fencer-D" in 1985, the 497.APIB from Grossenhain which was flying Sukhoï Su-17M2, started its conversion to Su-24 "Fencer-B/-C" when it took delivery of the equivalent of a first squadron of "Fencer-C" coming from the 116.GvBAP. The 'new' 497.BAP completed its conversion the next year with around thirty aircraft on strength. In 1989, both units became the first elements of the 16.VA to bear the brunt of the unilateral disarmament policy initiated by the USSR. As a good faith gesture, the long-range fighter-bombers Sukhoi Su-24 "Fencer" were repatriated and replaced by aircraft with a much less offensive profile: MiG-27K "Flogger-J2" and a regiment of MiG-29 (4). On the eve of the German unification, the 16.VA had just over 700 aircraft on strength, consisting of approximately 300 interceptors, 280 fighter-bombers, 80 reconnaissance aircraft and thirty transport and liaison aircraft. To better understand the power of such an arsenal, it should be noted that the 16.VA park was on average less than ten years old, due to the introduction of many new aircraft during the eighties. Difficile d'appréhender la puissance de la 16.VA en photos. Pas moins de 20 lignes de vol identiques à celle-ci pouvaient être remplies d'avions de combat (Finow, 11 mai 1993 avant le départ). © H.Mambour. It is difficult to apprehend the strength of the 16.VA with pictures only. Just bear in mind that no less than 20 flightlines identical to this one could be filled with combat aircraft (Finow on 11th May 1993 just before the departure from Germany). © H.Mambour. (1) In fifty years of existence, the Air Army supporting the Soviet air forces stationed in Eastern Germany changed its tactical number twice. The first time was in 1949 when the 16.VA became the 24.VA and the second time was in 1968 when it returned to its original designation of 16.VA. The 24.VA designation was then transferred to the tactical air army stationed in Ukraine, of which the headquarter was in Vinnitsa (not to be confused with the 24.DA or Strategic Air Army, of which the headquarters was located in Legnica in Poland). 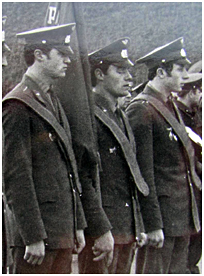 (2) In the mid-70s, Anatoly Kvotchour, then a young officer graduated from the Yeisk military air academy (near the Sea of Azov), joined upon his own request, the ranks of the 16.VA where he was assigned to the first regiment of the VVS to be re-equipped with Su-17M 'Fitter-D': the 20.GvIBAP at Gross Dölln. From: RYBAK (B) Anatoly Kvochur, Test Pilot, in AirForce Monthly. (3) Su-24 were presented to the 16.VA in July 1979, when a few aircraft of the 455.BAP from Voronezh were deployed to Gross Dölln airfield for ground and in flight demonstrations. It was the first deployment of 'Fencer' outside the USSR, organized on the occasion of the exercise 'Udar 79'. A firing demonstration had been also organized at the Wittstock range during the same time frame, which was probably related to the exercise. (4) These changes were expensive, particularly in terms of logistics, since no less than five units were displaced on this occasion during a real game of musical chairs! The 497.BAP moved to Lida in the Belorussian Military District, forcing out the local 911.APIB and its MiG-27Ks that joined Brand from which the 116.GvBAP had departed for Ross, also in Belarus. 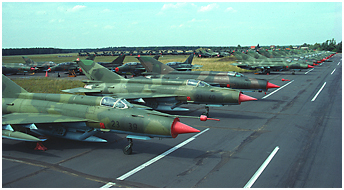 This in turn meant eviction of the MiG-29s of the 968.IAP that moved to Altenburg. Meanwhile, the MiG-27D/M of the 296.APIB evacuated Altenburg for Grossenhain to occupy facilities the 497.BAP had vacated! Thus, the Su-24/Ms of the 116.GvBAP and 497.BAP formed up with the "Fencer" aircraft of the 305.BAP at Postavy within the 1.BAD headquartered in Lida. The 116.GvBAP was transferred to the Belarus AF in 1993 (116.BRAB), while the 305.BAP and the 497.BAP left for Krasnodar in Russia. A short report of the Soviet television filmed at Grossenhain in 1989 before the Su-24 withdrawal can be downloaded > HERE. One will remark that already in 1987, the 727.BAP based at Debrecen in Hungary moved back to USSR at Kanatovo, whereas the 88.GvAPIB left that airfield for Debrecen with its MiG-27Ds.